GUARANTEED!!! 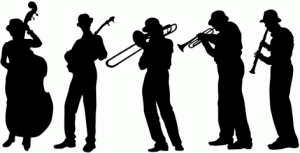 MUSICAL, EXCITING & FUN JAZZ FOR ALL OCCASIONS!!! The John Shillito Band is an exciting and accomplished ensemble with a strong New Orleans / Dixieland flavour, featuring a wide repertoire, a strong ensemble sound and exciting soloists. Our programmes strike all the right chords in many moods; from the poignant melancholy of the blues to the joy of a good-time vaudeville song; from the mellow emotions of a romantic ballad to the abandoned ebullience of a New Orleans street parade. With a front line that includes Bobby Fox and John Wurr and a rhythm section with Jim Douglas, Pete Furnish and drummers like Trevor Richards, Richie Bryant or Graham Smith you can expect an enthralling performance and plenty of high spirits. The band has been a popular favourite on the jazz club and festival circuit for over 25 years and has established a solid reputation with SAGA Jazz Holiday guests and discerning audiences all over Europe. Come along and see and hear for yourself! Riviera Ramblers is a new name for a new band whose “Le jazz hot” is attracting a lot of attention and many favourable comments. John Shillito, Zoe Lambeth, Bob Martin, John Whitlock, Dale Whitlock and Pete Furnish bring you a swing band with that "Hot Club" feel. The Riviera is the English Riviera, of course, Torbay and the South Devon coastal region. Much of the band’s repertoire originates from the Swing era of the 1930’s and 40’s and the front line brass and reeds move along harmoniously and energetically on a pulsating rhythm section that recalls Parisian “manouche / gypsy” sounds of that era. The players craft their “free and easy” melodic and rhythmic music with care and warmth, all the time relating to, and sharing fun with, their audiences. John and Zoe also add vocals, while the whole ensemble makes engaging listening and is an enticement to dance. The Riviera Ramblers received a tremendous positive response to their first festival appearance at Teignmouth in November 2018. (Quote from the festival administrator: “Everyone’s raving about your performance.”) But the listener doesn’t need to be steeped in jazz history - or even aware of jazz at all. The music is naturally attractive to the ear and almost irresistibly and contagiously impelling in its rhythms. It's an eminently listenable and danceable mix; originating out of New Orleans via Harlem, via Paris and, of course, via Torbay. This pocket-sized dance band is simply great for Swing Dances, Lindy Hops, corporate events and promotions, parties, wedding receptions and any event that can be enhanced with catchy swinging music with a smile on it's face. We're certainly blowing up a storm in the bay! John Shillito's bands have been the visitors' favourites at THE SHOPS AT DARTINGTON FOR OVER 30 YEARS!!! And our long-term residencies at the Crown & Sceptre, the Olde Smokey House, The Clifford, and The Sportsman's Inn are evidence of the bands' lasting and continuing popular appeal..
HAVING A PARTY? BIRTHDAY? WEDDING? ANNIVERSARY? B-B-Q? I have the ideal band to add music and fun to your function, and we're happy to help you celebrate any occasion. Our aim and motto: jazz things up a bit! - and we always do! More info? Make a booking? JOHN SHILLITO trumpet and bands for any occasion. Serious jazz with a smile on its face!